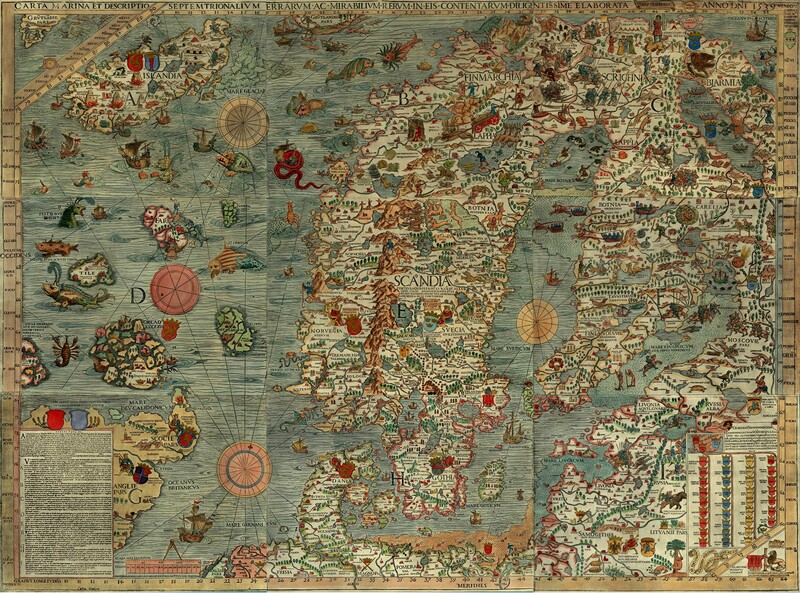 The Carta Marina (“map of the sea”) is the earliest detailed map of the Nordic countries (Denmark, Iceland, Finland, Sweden and Norway) drawn by the exiled Swedish Catholic ecclesiastic Olaus Magnus (1490–1557) in Rome between 1527 and 1539 and first published in Venice. Olaus had arrived in Italy on a diplomatic mission on behalf of the Lutheran king Gustav I of Sweden but stayed on possibly because of his brother Johannes’s religious feud with Swedish authorities. Because of their Catholic attachments, both Olaus and Johannes were banished by the reformed church of Sweden and later enjoyed successful careers in Italy. 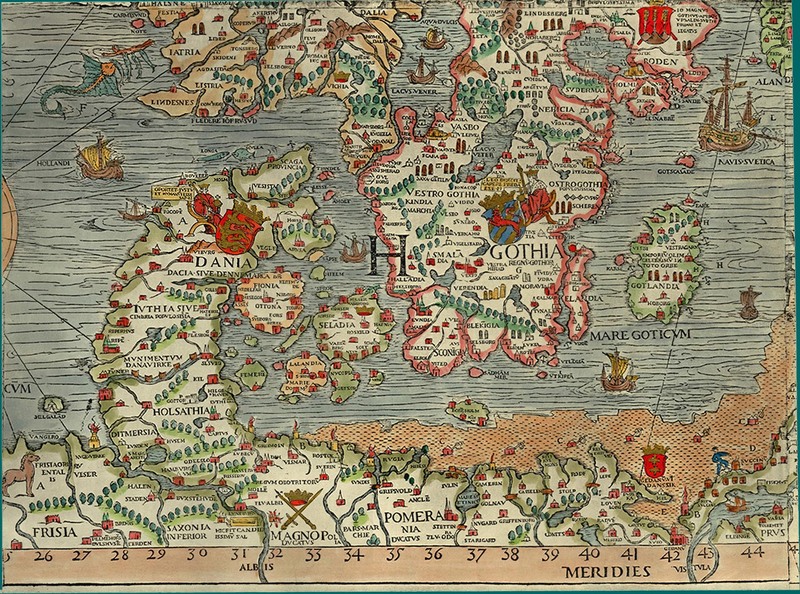 Prior to the Carta Marina, only two cartographical attempts had been made at depicting the Nordic countries, one by Danish geographer Claudius Clavus (late 1300s-early 1400s) and another by the Bavarian theologian and geographer Jacob Ziegler (1470/71-1549). 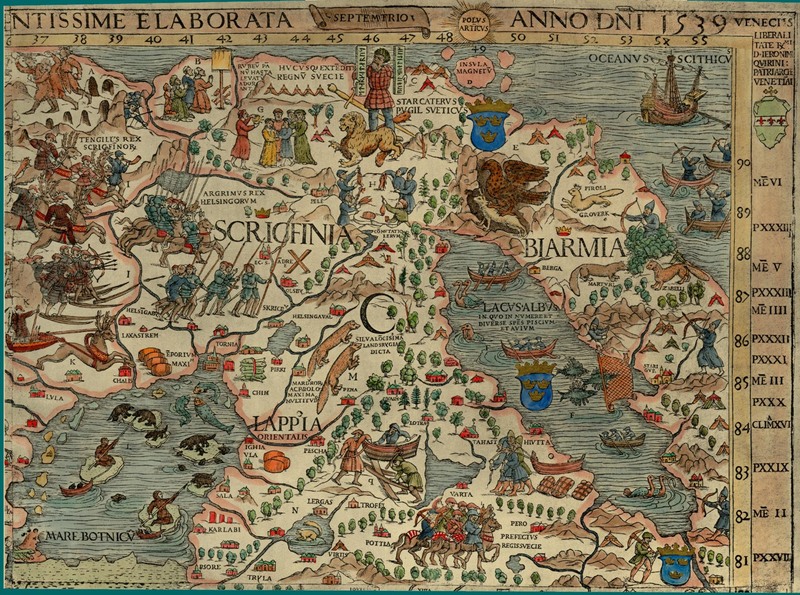 The Carta Marina influenced the Historia de Gentibus Septentrionalibus (“A Description of the Northen Peoples”), a monumental commentary on Nordic matters, which was printed in Rome in 1555 in Latin and later translated into Italian, German, English, Dutch and other languages. 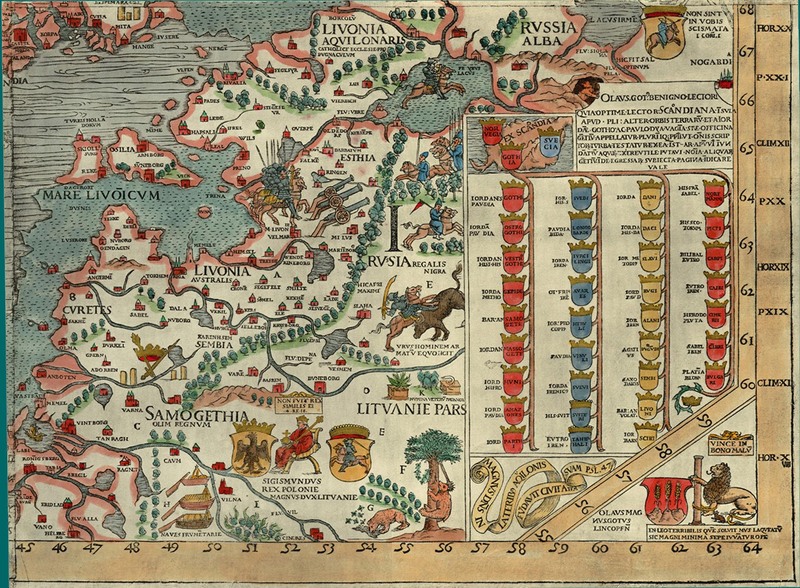 For the long time, the map was considered the stuff of legend until a copy was discovered in Munich in 1886. 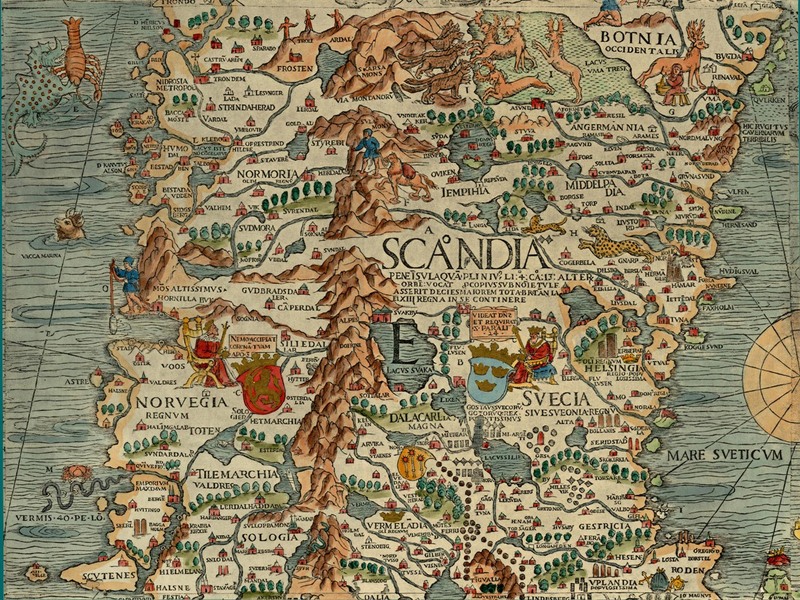 Another copy, found in Switzerland in 1962, now resides at Uppsala University in Sweden. 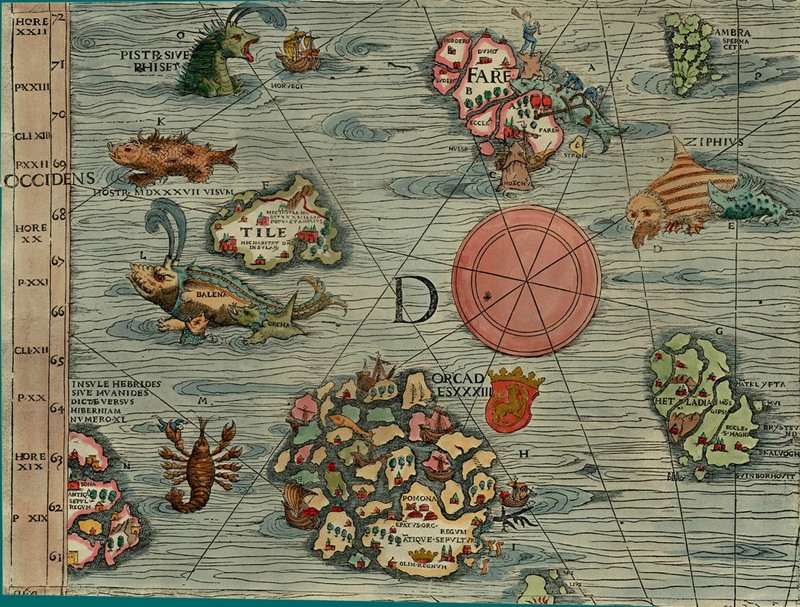 In medieval Europe, when travel was limited, marvellous and exotic creatures – often deformed and menacing – were frequently drawn to stir the imagination and to fill the empty spaces in maps. Sometimes they were warnings against unknown perils. Scary, fanciful figures were also used to show that every being, no matter how imperfect, was a creation of God and played a role in the providential order. They helped maintain a balance in the world and in the larger cosmos. 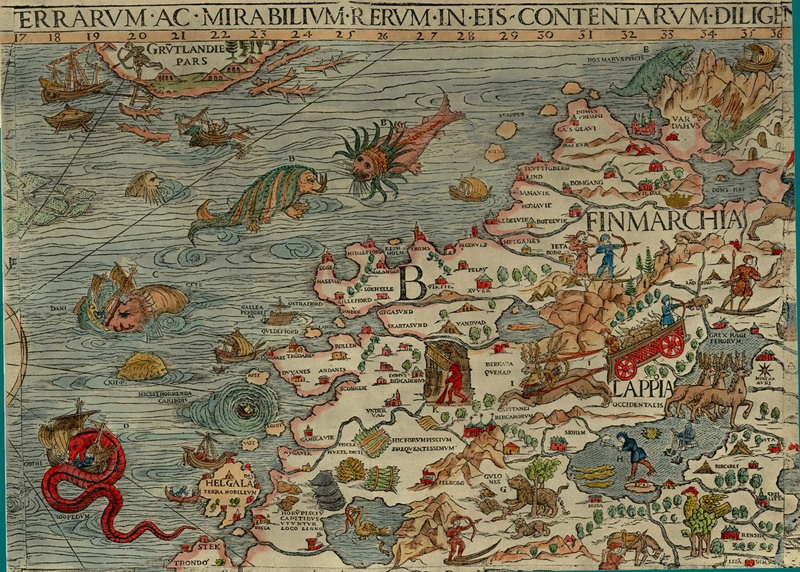 The Carta Marina was made at the beginning of the Age of Discovery (or Age of Exploration), when a residual belief in fantastic beings such as unicorns and hybrid human-animal races, still persisted in the European imagination. 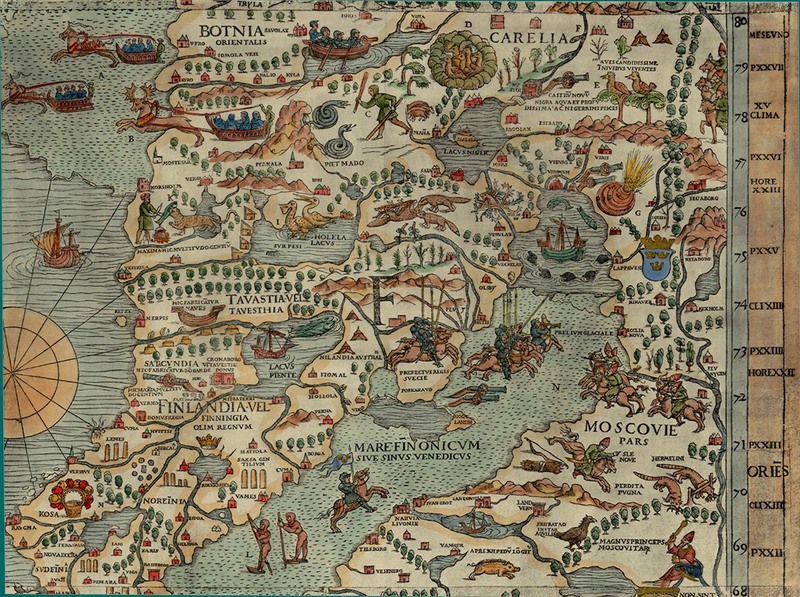 As a result, the map teems with imaginary characters. But that is not all. 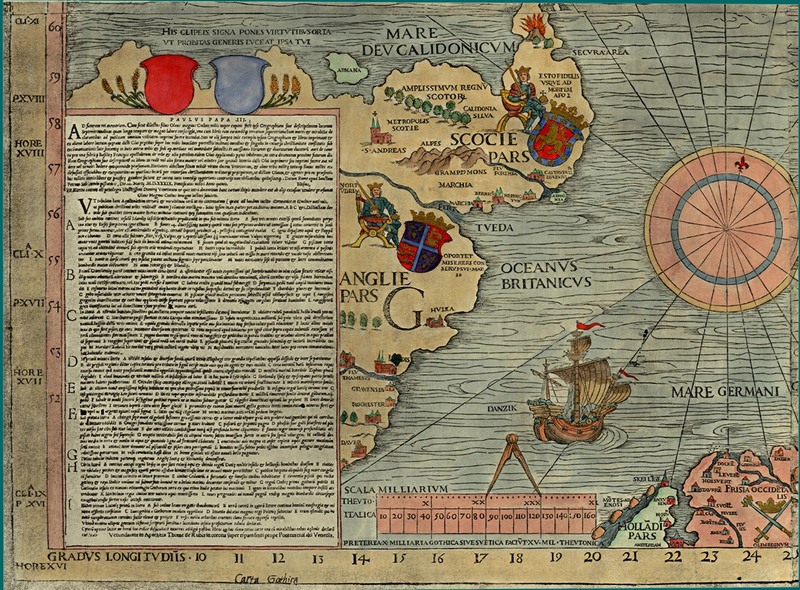 It also shows a “variety of marine activities, commercial traffic, fishing, the measuring of water depth and boats in distress” (T. Rossby, Graduate School of Oceanography, University of Rhode Island), which is unusual for the time. 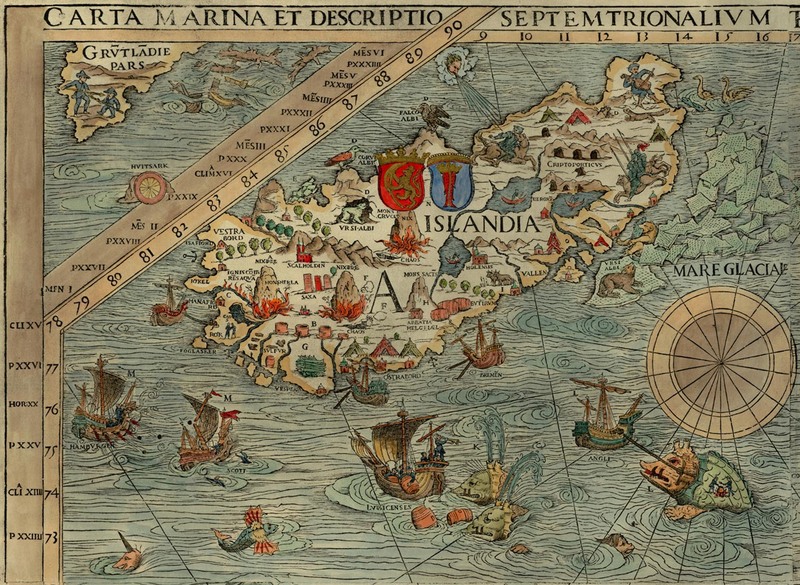 A beautiful interactive version of the Carta Marina with more information is available on Slate. Yeah, I love the poetic aspect. Excellent post, very interesting. The Carta Marina is beautiful. Have a great week-end!